Ten months ago, when I considered resolutions for 2010, I had no idea that this year I would cross (count it) two things off my bucket list. Actually, I didn't even know I had a bucket list--until a friend proposed going skydiving in celebration of her 25th birthday. Then I realized that I'd always wanted to go skying, but when it came down to actually planning it, paying for it, and jumping out of a plane, I needed someone else to motivate me. The same is apparently true for running. I'd always wanted to run a half marathon. I'd heard about people training and seen pictures of herds of skinny people in short shorts and sports bras, but for me it was just one of those I-would-love-to-do-that-but-I-would-die-if-I-ran-thirteen-miles kinds of things. The idea of actually training for something like that seemed daunting and too far out of my reach. But then my good friend Audra e-mailed me and announced she was going to train for a half marathon. She sent me the link to register for a race on October 10 in Wichita, Kansas, and told me to think about it. It was late spring at this point, and I was running a few times a week--just to keep in shape but not enough to run more than 2 or 3 miles at a time, so 13 miles sounded insane. Finally doing something I'd always wanted to was too tempting to resist, however, so I bought a cheap watch at Walmart and made a running playlist on my ipod. I mapped out a three-mile route around Jordan's neighborhood, and I made a tentative schedule that would have me ready to go by October. 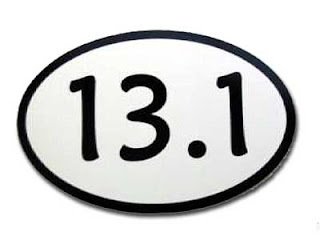 My goal seemed simple enough: 13.1 miles at 10-min/mile pace. That's 131 minutes or 2hrs 11minutes, give or take a few minutes on either end. I started out running intervals of 5 or 6 minutes running and 1 minute walking, and eventually I was able to run 30 or 40 minutes without stopping. I was feeling good. But the more I ran, the longer my runs became, and I soon found out that there's a huge difference between 8 miles and 4. Duh, it's twice as far. I know. But really, it's a whole different game, and I was sad to discover it was one I wasn't very good at. I'm a mostly positive person. At least, I try to be as positive as I can given the circumstances. But for some reason, this running thing showed a side of me I didn't like. And it threw me for a loop. I was whiny, stressed, pessimistic, and convinced that when it actually came down to it, I would fail. I was attempting something I wasn't at least mostly sure I would be able to do well. And well by my standards, which is usually a high bar. So I didn't register, and I didn't tell anyone I was training. I remained noncommittal about the whole thing until I finally officially signed up and wrote a blog post about it. Then, suddenly, it seemed more real once I actually said it out loud. My goal time dropped from 2:10 to 2:30, and then after an 8-mile run that felt like death itself, I decided I was just going to be happy to finish. Screw making good time. As race day approached, I became more and more nervous, especially after a terrible bathroom episode while on a 5-mile run, and I couldn't stop thinking about being in the middle of the race and having nowhere to relieve myself. It was depressing, so I stopped thinking about it. Okay, that's a lie. It was all I could think about. And then it was here, and I headed off to Kansas to meet up with Cori, Audra, Joey, and Hilda. I was worried about eating too much fiber, too much protein, drinking too little water, too much juice. I knew anything I ate might come back to haunt me later. While Cori scarfed down a burger and fries on Saturday night, I picked at chips, fearfully dipping them in runny salsa before chugging glass after glass of water. Sunday morning I woke up at 6:15. I popped my contacts in, tugged on my running shoes, ate a quick (slight) breakfast of a piece of toast and a half glass of OJ, and pinned #2220 to the front of my shirt. Then Cori and I drove 15 minutes to downtown Wichita, parked, and calmly walked to the start line--all while butterflies slammed against the inside of my stomach. It was surprisingly easy finding Joey and Audra in the crowd, and before I knew it we were waiting with an excited mob of runners, listening to the horn blow, and moving forward with the crowd. From that point on, I was focused on one thing--the finish. As I zig-zagged through the crowd, Colbie Caillat singing in my ears, I looked around and thought, This is awesome! I'd gotten used to running alone, meandering either through Jordan's neighborhood or a nearby park, that I'd been missing the community of running. Two thousand pairs of toned calves and blistered feet, hearts pumping, arms moving, feet kicking up gravel. Maybe I had beginner's luck, or maybe it was runner's high, but the first 7 miles went by before I knew it. Besides a quick 30-second stop at a few water stations, I went for over an hour without taking a legit walk break, and I was under my 10-min/mile goal. It wasn't until mile 9 that things got really hard. When am I going to reach 10 miles! I thought, looking ahead to see a long line of runners stretched out before me. For the first time, I feared keeping up my (for me) blistering pace. When I finally did reach the blessed sign marked 10, I shouted, "Yes! Thank the Good Lord!" A girl in pink next to me turned and smiled. After a quick stop for water, I decided that I was going to stop again at mile 11. So I started running and running...and running. After ten minutes, I still hadn't seen any sign. I haven't slowed down that much, I thought. Then, like a beacon of light in a dark night, I saw a water station. "What MILE is this?" I asked the nearest worker. "You're almost to mile 12," she said, handing me a cup of Gatorade. I guess that's the upside to not having clearly marked miles markers. Only a mile and a half to go; then I could stop. And eat. When mile 12 hit, I was dead on my feet, but somehow I kept them moving. It's weird how that works. I mean, I could have stopped. No one was technically making me run, but my fear of failure and hope of greatness pushed me on. I think mile 12 was the worst. I was so close, and yet I still had 1.1 miles to go. As much as I wanted to sprint to the finish, it was all I could do to keep my current pace. There was a lady in orange I had my eye on; as long as she was near me, I was fine. If she started to pull away, it meant I needed to run faster. With about two tenths of a mile to go, I saw Hilda. She wasn't running, but I stayed at her apartment in Wichita, and she'd agreed to meet me at the finish. I slapped her hand and smiled, and it was beautiful to see a friendly face. When I ran across the finish, there were people lining the road, cheering, it seemed, just for me. I felt suddenly felt alone, but in a good way. I crossed the finish line and at last gave my legs the okay to stand still. Then I looked at the clock. I couldn't believe it. I'd run faster and longer than I ever had before, and I beat my goal time! That's when I almost threw up. It's ironic, really. With all my worry about having to poop in the middle of the race, I hadn't even thought about something coming out the other end. It was a close call, but let's just say I was able to hold it down. In the wake of my great success, I grabbed a water bottle, Gatorade, and somehow found Hilda. The wind, which had felt so refreshing just two minutes ago, now felt like a knife, slicing through my sweat and quickly freezing me to death. I wrapped what looked like a sheet of tinfoil around myself, and we went back to the race to wait for Audra, Joey, and Cori. I used Hilda's phone to call Jordan, where I left an excited, out-of-breath message, which I have no doubt he wasn't able to understand. "I'm so excited!" I shouted to Hilda. "I can't believe I did it!" And I really couldn't. Like I said, I'd been horribly pessimistic about the whole thing--certainly something to learn for next time. But when it came down to it, the adrenaline kicked in, and I just kept running. Thirteen whole miles (plus a tenth!) at 9:48 min/mile. This story could have ended horribly. I ran 15-minute miles. I had to stop at every mile and go to the bathroom. I tripped and twisted my ankle. The possibilities for disaster are endless. Then I would have cried and written a post about how disappointed I am, how silly I feel, and how much of a failure I've become. Even though in this case nothing like that happened, I'm not naive enough to think that I won't even have setbacks or days when real-life me just can't measure up to my expectations for myself. But that doesn't mean I should stop setting a high bar, because it's just that much sweeter when I finally finish. In a world of ultra runners and 100-mile races, 13 miles isn't all that much, and 10-minute miles isn't lightening fast. But it was for me, and that's what I measured against. So I couldn't be happier. Another check for my bucket list. A medal for my wall. A 13.1 decal for my car. And the knowledge that I can do it, because just last weekend, I did. I'm so proud of you, Amanda!! Great job!! For not having one, you're whizzing through your bucket list. Way to go! Great post! And eerily similar to mine, which is weird since I wrote mine before reading yours. But cool! And great job. We are awesome, and I am so proud of us for doing this!! We are the coolest pair of friends that ever lived! And next time we meet in Wichita to hang out, Jordan is COMING. :) Love you! Thanks, Lauren! Maybe I'll run in St. Louis sometime, and you can come watch! Audra, yes, we are eerily similar. We are awesome, and I'm so proud of you! Next time, Jordan is coming for sure.